The tomb of Tutankhmun is more than a mask, a mummy, Howard Carter… It is an historical document with lots of useful information about the funerary belief in Ancient Egypt. Let’s focus now on the funerary chamber. Funerary Chamber of Tutankhmun. Image: National Geographic. The decoration of the funerary chamber. The funerary chamber of Tutankhmun is the only decorated room in the tomb. The decorative program is not the typical one for a royal burial in Ancient Egypt. Starting from right to left, we find a secuence of images with contains a logic. 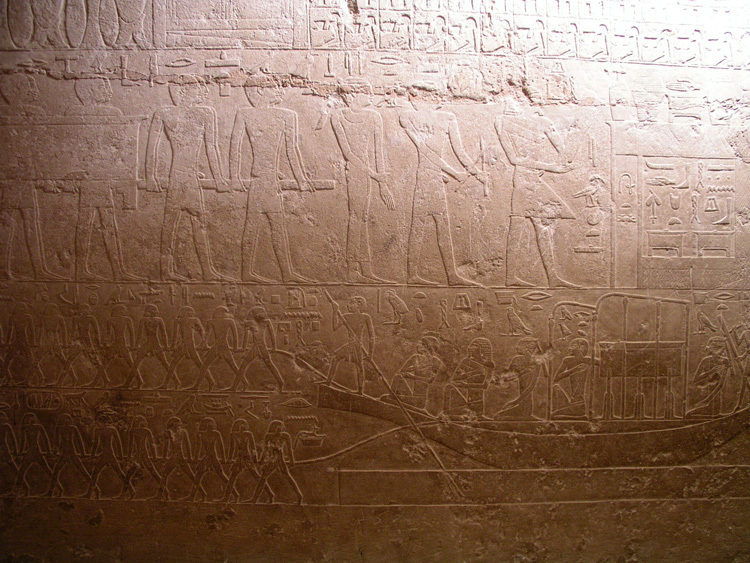 On the East wall the funerary cortege is dragging the mummy of Tutankhmun on his sledge to the tomb. That is, Tutankhamun is being taken to the world of the dead; he is facing the first moment of the death in Ancient Egypt. The Ancient Egyptian Mourning Ritual, existed also in Amarna? During the reign of Akhenaten many things changed in Ancient Egypt. The new Pharaoh modified the artistic canon, his residence, the religion, the cult…but what happened with the death? Those ancient Egyptian people from Amarna…did not die? Yes, they did, there was a cemetery. There were also mummies and coffins. People continued being buried into tombs; and the walls of those tombs were decorated with reliefs. That is, there was a funerary art and a funerary architecture. A mortuary practice existed. Two Professional Mourning Men in Ancient Egypt? In Ancient Egypt a couple of two professional women in the role of Isis and Nephthys were actively involved in the dead’s resurrection. They appear usually at both ends of the coffin, during the Opening of the Mouth Ceremony or, from the New Kingdom, kneeling and offering two globular vases nw at the end of that funerary ceremony. At the beginning we thought that this scene of the professional mourners offering the vases nw was something exclusive of the New Kingdom and of the Theban area. However we were maybe wrong; Ancient Egypt reveals always something new. In some tombs from the Old Kingdom and from the Memphite area the artists of Ancient Egypt included an iconography, which remembers that one from later periods and from the south. That is the case of the tomb of Iasen in Gizah (G2196) from the Old Kingdom. In the funerary chapel, to the left of the niche with the statue of the deceased, there is an image of Iasen seated and facing the offering table. Underneath two unidentified kneeling men are facing the dead and offering nw vases. Their position clearly reminds the one of the two professional mourners at the end of the Opening of the Mouth Ceremony, which will become so common during the New Kingdom. Isis and Nephthys in the Ancient Egyptian Coffin of Nesykhonsu. The iconography in Ancient Egypt was not gratuitous. Every image had a reason to be, but also every space. From the Old Kingdom the two mourners in the role of Isis and Nephthys were accompanying the dead until the tomb at both ends of the mummy. The hieroglyphs of the wooden coffins from the Middle Kingdom tell how Isis was located at the feet and Nephthys at the head. This position could be due to a will of reproducing the moment of the rebirth of the deceased. Later on the art of Ancient Egypt found in the coffin a new surface for including several icons, as the two professional mourners. From the XXI Dynasty became common to include these two female figures upside down in the in the external feet surface of the lid of the anthropoid coffin. In Ancient Egypt Isis was the South and Nephthys the North. In Ancient Egypt the Legend of Osiris was so important that it was integrated into the solar theology. As a result Isis and Nephthys, the two mourners of Osiris, became an essential part of some solar iconography, so both from the New Kingdom were depicted flanking the solar disk in its daily rebirth. It also had an effect in the holy conception of geography in Ancient Egypt. If the rising sun occupied the east and the sunset the west, the two mourning goddesses had to be also located somewhere, so they had to have also a geographical assignation: north and south. At that point the titles of the two goddesses are quite explicit. In Ancient Egypt, Isis was “The One of the South” and Nephthys “The One of the North”. In Ancient Egypt were Isis and Nephthys Essential in Cartonnages. Cartonnages in Ancient Egypt were used over the wrapped mummy mainly for mummy masks and some important parts of the body. The cartonnage of Irtirutja in the Metropolitan Museum of Art of New York dates from the Ptolemaic period. In it one can see how the artist of Ancient Egypt dedicated this technique for covering some special parts of the mummy. Cartonnages on the mummy of Irtirutja from Ptolemaic Period. Photo: Metropolitan Museum of Art of New York. The fact of choosing those parts of the anatomy could reveal an intention of including the essential elements in the belief of Ancient Egypt for the dead’s resurrection. Obviously the mummy mask was obligated, since, among the many faculties the dead had to recover, there were the faculties of seeing and breathing. The feet of the mummy were covered with two images of Anubis. It seems as if they were inverted, but they are actually dressed to the deceased’s eyesight. Two images of the scarab with the solar disk were also a grant of the mummy’s rebirth. In Ancient Egypt, the Osiriac resurrection and the solar rebirth were united, in the iconography and in the religious texts. Image of Nephthys mourning in the mummy of Irtirutja. Photo: Metropolitan Museum of Art of New York. The four sons of Horus (two at each side of the body) were also included in the composition, They were a personification of the canopic jars, which contained the dead’s viscera, so they accompanied always the deceased. “Reading” the Ancient Egypt Funeral in the Tomb of Qar. In Ancient Egypt art not always all scenes of a decoration were connected. But when it happens, it is important to guess the correct order of them and “read” the story. On January 13th we saw how a small scene from tomb of Qar could be a summarized or codified representation of the Opening of the Mouth ceremony. But this is not the only surprise of this Egyptian tomb. According to Simpson the normal order of the funerary scenes in the north wall was, following a more occidental logic, from the top downwards; so from left to right in the upper register and from right to left in the lower one. The sequence would start with the three figures of the Drt mourner, the wt (embalmer) and would end with the arrival to the building on the left, which was considered as the embalming place. However, the Egyptian logic in art was different from ours. 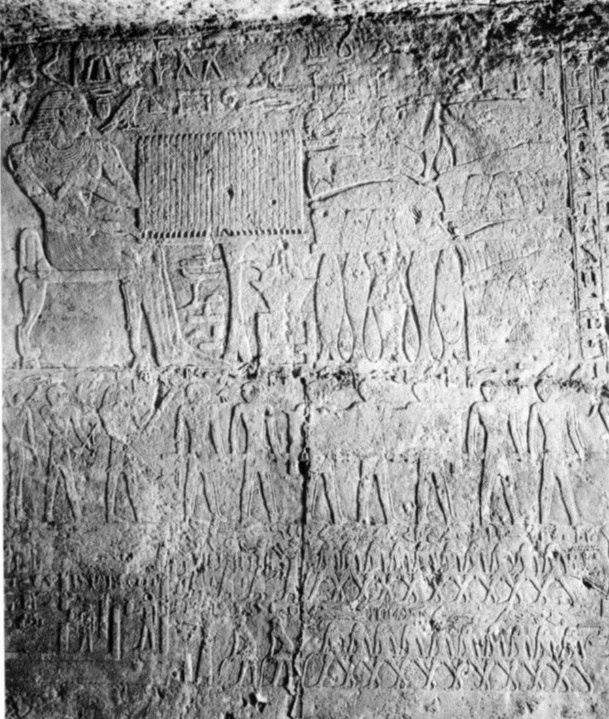 Scene of the funerary procession in the tomb of Qar. V-VI Dynasty. Giza. Image from W. K. Simpson. The word identifying the building on the left is uabet , which means a “pure and clean place”, but not necessarily just for “embalming”. We also know that uabet from the Middle Kingdom also meant “tomb”. Maybe the building in the scene was the Qar’s tomb. If we think like that, the decoration then maybe should be read in a different direction; in fact sometimes Egyptian artists designed a decoration from down to top. The sequence would start at the right of the lower register. The cortège moves the coffin on the boat until the uabet building, the tomb (this would be a reproduction of the Egyptian mythical voyage to Abydos), the burial place and also the embalming place. We notice that the corpse is being accompanied by the two Drty mourners with short hair, the wt (embalmer) and the lector priest. 1) They three and the coffin transport. That would be the staff and the mummy getting into the tomb. The tools of the lector priest. All necessary for the purification of the feeding. It should refer to the final food offerings. The icon shows that in this w3t there is water. All these four points refers to what the staff needed for the Opening of the Mouth ceremony, as we can see in some tombs of the New Kingdom. Funerary practice in the mastaba of Qar with lector priest, the embalmer and the mourner Drt; the scene is closed by two images of an ox. V-VI Dynasty. Giza. Image: W.K. Simpson. 3) They three during the D3t r3 and the slaughter of the ox. We have already seen that this image could be a way of representing the Opening of the Mouth ceremony. Summing up, the decoration of the north wall in the tomb of Qar could be read from down to top. The artist would have “narrated” the arrival of the funerary procession to the tomb, the resurrection rites practiced on the mummy and for that reason finally at the final top of the wall Qar sits alive in front of his funerary offerings. Qar sits in front of his funerary offerings. Scene at the top of the north wall. The funerary ceremony is below. Tomb of Qar in Giza. V-VI Dynasty. Photo: W. K. Simpson. This inscription deserves special attention, because it is not too clear. It seems to refer to purification (abu) of the “feeding” (D3t r3).